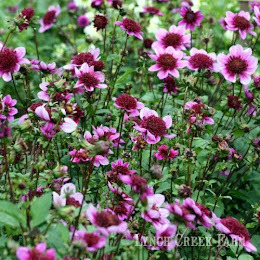 Lynch Creek Dahlias: Dahlia Classification: Anemone, Orchid, Peony—And Surprise! They're All Dahlias! 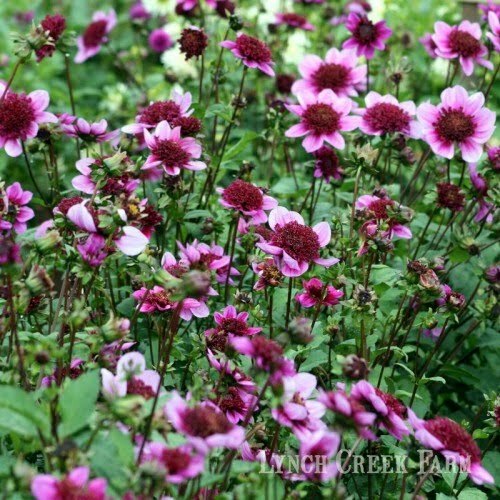 Dahlia Classification: Anemone, Orchid, Peony—And Surprise! They're All Dahlias! 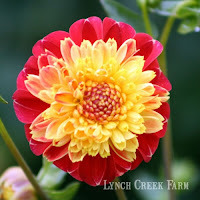 The peony dahlia is open-centered, and has at least two rows (and sometimes as many as five or six) of ray florets around a fully visible disc-flower center. It is popular in England in herbaceous borders. Probably the best-known peony type there is Bishop of Llandaff, which is very similar to the Japanese Bishop, which is popular here in the U.S. Both have stunning purplish foliage. A much fuller blossom is Enrique, another prolific bloomer. 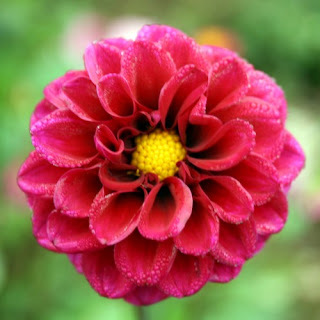 The orchid dahlia was developed in the early 1900s, when it was grown in France and Germany. It has variously been called orchid-flowered, orchis, stella, star and clematis, but the American Dahlia Society recognized it as a class in 1949. It is open-centered with a single row of long ray florets rolled inward, or involute, for two-thirds or more of their length. They surround a flat disc flower. 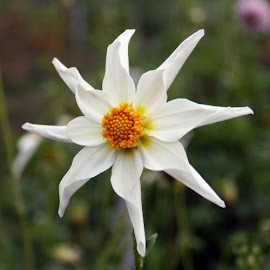 A good example is "Tahoma Hope," a birdlike white flower on a compact three-foot plant, described at the Farm as "a stunning little showoff." A double version of the orchid type is the stellar dahlia. Fully double and similar to a formal decorative type, the stellar dahlia has narrower, involute ray florets slightly recurved on the stem. Originally a type included in the novelty classification created in 1983, the stellar dahlia got its own classification in 2002 when the ADS established the novelty open, novelty fully double and stellar categories. Dahlias enjoy different levels of popularity in different parts of the world, and the stellar dahlia is more popular "down under" than it is in this country. The anemone dahlia could be mistaken for a double, for the tubular disc flowers of the center are long and fluffy. They rise above the one or more rows of spoon-shaped ray florets that surround them. The form has been grown since the 1800s, when it was developed by growers in Ireland and Germany, but few varieties were known until well into the 1900s. The ADS classified anemone dahlias as a separate form in the early 1920s. 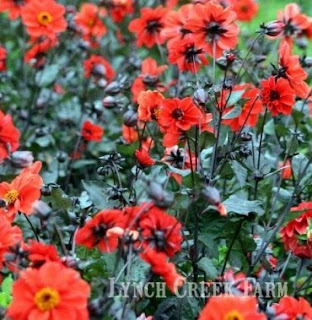 At Lynch Creek Farm, the crew likes Blue Bayou, a rich lavender flower, and Alpen Fury, a bicolor red and yellow. Like many of their type, these are better garden flowers than cut flowers, but they are stunning in mixed plantings.